Lawmakers in Arizona fear edible pot products, which include cookies and candy, might be consumed by children. 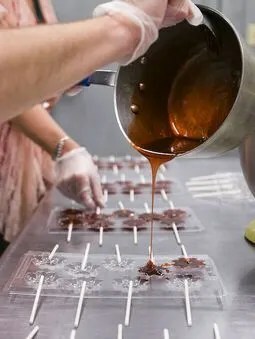 The individually packaged brownies, lollipops and chocolate-dipped cookies for sale at the Green Halo dispensary in Tucson look like kid-friendly snacks. They have one ingredient, however, that makes them anything but: The tempting confections are infused with marijuana. Staff at the Green Halo say that about half of the patients using their dispensary prefer to take their doses of medical marijuana in edible items. And although the candy-wrapper medical drugs can be bought only at Arizona’s medical-marijuana dispensaries by licensed cardholders, law-enforcement officials are concerned the items will end up in the hands of children. It’s already happened, according to Phoenix police. A West Valley eighth-grader was caught earlier this month with a piece of marijuana-infused candy, and police believe she had passed the candy out to other students at Pendergast Elementary School. This week in California, a child obtained a marijuana-laced brownie that sent seven primary students to a hospital, according to an NBC report. To solve the problem and head off any potential danger to children, new proposed guidelines would require edible marijuana products in Arizona to be packaged to look more like medicine. A bill has already passed the Arizona Senate and is advancing in the House. It would require dispensaries to package their products in white, opaque wrappers with black lettering. It also empowers the Arizona Department of Health Services, which regulates the state’s medical-marijuana program, to immediately revoke the license of any dispensary that doesn’t comply. Senate Bill 1440 would expand current health-department rules, which say dispensaries must put a standard warning label on their products similar to those found on cigarettes, among other labeling requirements. 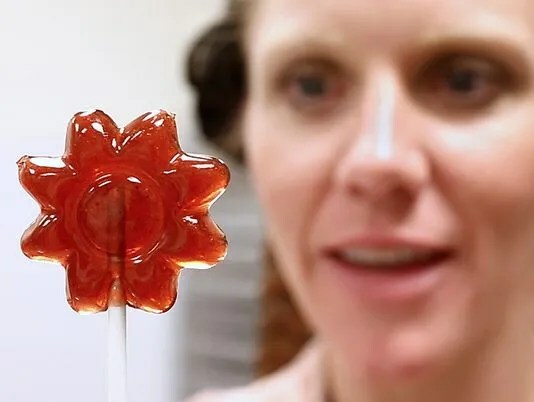 “We are seeing in the marketplace materials that resemble candy, resemble soda, are branded in a way that you couldn’t tell from looking at them that they’re medicine,” said Kimberly MacEachern, staff attorney for the Arizona Prosecuting Attorneys’ Advisory Council. Speaking before the House Public Safety, Military and Regulatory Affairs Committee this week, MacEachern said the nondescript packaging would conform to federal regulations for the packaging of medicine. To illustrate the point, Republican Sen. Kimberly Yee has been passing around to legislators a series of photographs taken of candy and other medical-marijuana products seized during criminal investigations. Among the images are colorful gummy candies wrapped in cellophane and chocolate bars in packaging that mimics the Wonka brand. Yee said the items were seized from dispensaries, but Heather Manus, who oversees production of marijuana-infused products at the Green Halo, said the items were produced by caregiver collectives or from illegal sources. 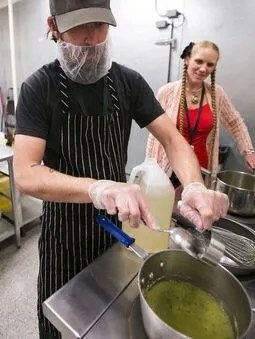 The Green Halo is the only dispensary to operate a state-licensed kitchen, and it supplies edible medical-marijuana products to several other licensed dispensaries in Arizona. “We’re just creating gentle, loving medicine here, and it’s not something that is scary or freaky,” Manus said. Known to patients as Nurse Heather, Manus first produced edibles in New Mexico for legal cardholders in hospice care and says it’s the best way to use medical marijuana because the relief is long-lasting. Smoking provides the quickest onset and lasts two to three hours, while people who ingest the marijuana will feel its effects for up to six hours, she said. If the law requires products to be more plainly wrapped and the contents hidden, Manus said, the dispensary will abide by the rules.